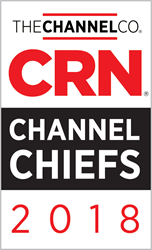 The 2018 CRN Channel Chiefs list is a look at the executives shaping today's enterprise tech channel. Marco has lead exponential growth via our channel, both domestically and internationally, and there continues to be a bright future ahead for Trusted Metrics. Trusted Metrics, creator of the award-winning Elastic SOC® platform, announced today that CRN®, a brand of The Channel Company, has named Marco Muto, COO, to its prestigious list of 2018 Channel Chiefs. The executives on this annual list represent top leaders in the IT channel who excel at driving growth and revenue in their organization through channel partners. 1. Scalable, Flexible and Affordable: Elastic SOC® is a proprietary, multi-tenant, cloud-based SOC portal for MSSPs and MSPs, combined with predictable monthly pricing based on the number of log/event sources, not events per second (EPS) or other variable data consumption models. 2. Services, too: Trusted Metrics offers its team of security experts to not only help configure and maintain the SIEM/SOC platform, but also provide 24x7 security event monitoring, analysis and escalation. 3. Channel History: Trusted Metrics is not a stranger to the channel; we developed our roots as a former service provider, reselling security vendor technology to customers in all verticals across the US. Trusted Metrics’ Founder and CEO, Michael Menefee said, “This recognition by CRN reinforces our vision that the channel program and technology we’ve custom-built for partners, alongside our ability to execute on its delivery, is exactly in-line with market demand. Marco has lead exponential growth via our channel, both domestically and internationally, and there continues to be a bright future ahead for Trusted Metrics. The 2018 CRN Channel Chiefs list is featured online at http://www.crn.com/channelchiefs and will appear in the February 2018 issue of CRN. About Trusted Metrics: Trusted Metrics Inc. provides Elastic SOC®, a multi-tenant, cloud-based software and services solution which gives organizations of any size the ability to incorporate next-gen SIEM as a framework for centralized log correlation, intrusion detection, asset management, threat intelligence, alarm generation and network performance management into a single console. This solution was purpose-built for managed service providers (MSPs) and managed security service providers (MSSPs), giving them the ability to deploy a white-labeled virtual SOC for their clients, enabling around-the-clock network security monitoring, protection and response. About The Channel Company: The Channel Company enables breakthrough IT channel performance with our dominant media, engaging events, expert consulting and education and innovative marketing services and platforms. As the channel catalyst, we connect and empower technology suppliers, solution providers and end users. Backed by more than 30 years of unequalled channel experience, we draw from our deep knowledge to envision innovative new solutions for ever-evolving challenges in the technology marketplace.